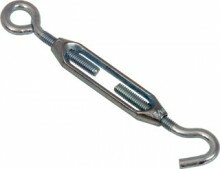 Turnbuckle overall length 130mm fully tightened and 195mm fully extended. Threaded section approx 6mm dia. Click the button below to add the Turnbuckle to your wish list.